UN Secretary General Ban Ki-moon has warned of dire consequences if Burma continues to ban most foreign aid workers from its cyclone relief work. Speaking before the UN launched its $187m (£96m) appeal to help those hit by the cyclone, he said early action was needed to prevent catastrophe. Burma, where the UN fears the death toll could reach 100,000, says it will accept aid from any quarter. 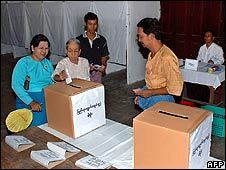 A Burmese constitutional referendum scheduled for Saturday is going ahead. Polls opened early on Saturday in all but the worst-affected areas, which will vote on 24 May, and are due to close at 1600 (0930GMT). The country's ruling generals say the referendum will pave the way for democratic elections in 2010, while the opposition says it is intended to tighten the generals' rule. They have been criticised for their handling of the crisis in which officially 23,335 people were killed and 37,019 are missing. The cyclone left towns flattened, infrastructure destroyed and 5,000 sq km (1,930 sq miles) of farmland in the Irrawaddy delta under water and littered with dead bodies. There are reports that a senior general over-rode requests from his officers to divert army resources to help the cyclone victims - in order to maintain security for the poll. Reporting on the referendum from Hlegu, a town 48km (30 miles) north of Rangoon, the Associated Press says turnout has been very light, with people coming to polling stations in small groups and no sign of long queues. One voter, retired soldier Nyo Aye, said he had voted Yes even though he had not read the constitution. "The government would not do anything inappropriate or bad for the country," the 65-year-old said. Groups involved in last year's pro-democracy protests accused the junta of concentrating on a "sham constitutional referendum" instead of "putting all resources toward saving the lives" of cyclone victims. Aid agencies already in Burma say they have been doing what they can but are frustrated by the government's reluctance to allow international aid teams into the country and its insistence on distributing aid itself. The UN believes as many as 1.5 million people could have been affected by Cyclone Nargis, which struck on 3 May, and many say Burma does not have the capacity to respond adequately on its own. Two BBC correspondents who have travelled to the Irrawaddy delta say tens of thousands of bodies are strewn across the landscape, with houses toppled and trees uprooted. They say diseases like dysentery are already starting to take hold, and although some aid has arrived there is still no relief effort to match the size of the catastrophe. Mr Ban warned that lives of the survivors could be at risk if the military leaders refused international aid. "If early action is not taken and relief measures put in place, the medium-term effect of this tragedy could be truly catastrophic," he said. "The sheer survival of the affected people is at stake." Mr Ban says he has not been able to get through to the country's leaders to speak to them directly. The World Food Programme says it is in talks with the government after tonnes of aid it flew into Burma was impounded by the military authorities who wanted to control its distribution. The UN agency threatened to suspend relief flights, but later said they would resume on Saturday, while negotiations continued. 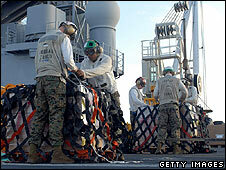 The Burmese UN envoy, Ambassador Kyaw Tint Swe, said the first US relief flight was expected to arrive on Monday. He said that his country was ready to accept help from any quarter. Other aid has been flown in from Burma's allies, such as China and Thailand, and Burma-based aid workers have been distributing food and emergency aid where possible.